I noticed that ECIS statement did not say anything about software patents. However, it did say that it’s goal is to allow all people to access without being charged by proprietary vendors. I wonder, when the EU finally allows software patents that there will be a provision that specifically prevents patents from being used as a weapon in the monopoly wars as far as public interoperability (whatever that means) goes. The European Commission needs to be pressured to revise its digital agenda. They were led to using words like “interoperability” instead of “open standards”. Another common tactic is to squeeze in terms like “market standards”. It sounds almost like standards, but it’s not. ‘”Market standards” as a euphemism for monopolies is a rather astute piece of spin doctory for the technically inept,” said this person whom people recognise as the FSFE’s founder (Georg Greve). 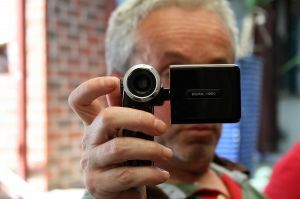 –Georg GreveSome people would say that H.264 has become the “market standard” for video, but it is totally inappropriate because of software patents. MPEG-LA stayed in the background with its patents so that people naively help it become the “market standard”. At the very least, European authorities need to see this and respond to it by exclusion. Several days ago Google formally took action and released VP8 as free software (BSD). “Flash embraces Google’s open video codec,” reports The Register. Adobe has rolled out an HTML5 development kit and announced that Flash will use Google’s freshly open sourced VP8 video codec. The company wants you to know that despite its tussle with Steve Jobs, it very much believes in web standards. The relation between Freedom and Apple is like that of fire and ice. They cannot co-exist. Steve Jobs reportedly had an email exchange recently with Gawker Media’s Ryan Tate. Gawker Media is the blog firm which owns Gizmodo, the blogsite that bought published photos of a lost iPhone prototype. I cannot comment on Gizmodo’s iPhone stint, or Tate’s intentions behind his email to Steve Jobs. However, I do care what Steve Jobs says; many people take his word seriously. That’s not where freedom stops. This freedom is not even a grain of sand in the vast desert of freedom. Choosing Apple devices to get these few freedoms is like choosing prison to get safety. Google’s new open source VP8 video codec can’t do DRM, so YouTube will still use Flash to play protected content (and to insert ads). In fact, says Google engineering VP Linus Upson, “DRM is fundamentally in conflict with open source and open standards because to do DRM you need secrets”. It’s no secret that MPEG-LA, the private company that handles patent pools for a variety of digital video standards, including the widely used H.264 — and recently began dabbling in patent trolling, has suggested that there can be no digital video without licensing patents from its patent pools. And, of course, there were just rumors (kicked off by a Steve Jobs email), that MPEG-LA was gearing up to sue any “open” video standard out of existence. Well, that whole story got a bit more complex this week when Google announced its plans to open up its VP8 video codec, and make it royalty free, under the WebM name. An MPEG-LA spokesperson confirmed the comments in an email to The Reg. The threats originally came from Rupert Murdoch’s press. It is potentially just FUD which is intended to suppress VP8 adoption. Some people say it should be ignored despite the bad press (e.g. [1, 2, 3] MPEG-LA generates for its competitor, VP8. WebM will make the hippies among the free-software movement (“software patents are like Nanking Massacre, only obviously far worse”) happy. It’ll allow developers to create free and open-source streaming apps and technologies without worrying about the licensing expense; one can only hope that Google has also ensured that there won’t be any risk that a patent shark might come along and sue the developers at a future date, but only time will tell. Otherwise, WebM a non-entity. “Patent shark” is an outdated term. It’s now known as “patent troll” and Larry Horn pretty much admitted being one (that’s the work he does ‘on the side’, so to speak). For years we were told by Mozilla and the like that they won’t ship MPEG codecs, because they are patented. At the same time they refuse to support the patent-free but high-quality Dirac codec (developed by the BBC using techniques whose patents expired – Xiph used the same method when designing Vorbis). Then one day Google shows up and releases the sources to a codec that’s merely a derivate of the patented MPEG-4 AVC Baseline codec. Suddenly all hell breaks loose, Mozilla immediately supports the new (possibly patented) codec. I suspect that since Mozilla (and Opera as well) gets many million dollars per year from Google for being the default search provider, questions about WebM are not asked. I think Mozilla mainly wants to please its pimp to get the money. This sort of accusation against Mozilla and Opera is not fair. Even Microsoft had to give VP8 the nod. They are being pragmatic. Here is the response of Monty Montgomery from Xiph. “WebM VP8 Video Codec Won’t End Theora,” as one site puts it. They are complementary and Google helped fund Theora for particular architectures/form factors. At Google’s I/O conference, the search giant this week released the VP8 video codec as open source and launched the WebM project for online video. The effort has already been embraced by multiple browser vendors. Pogson concludes with some amazing numbers.